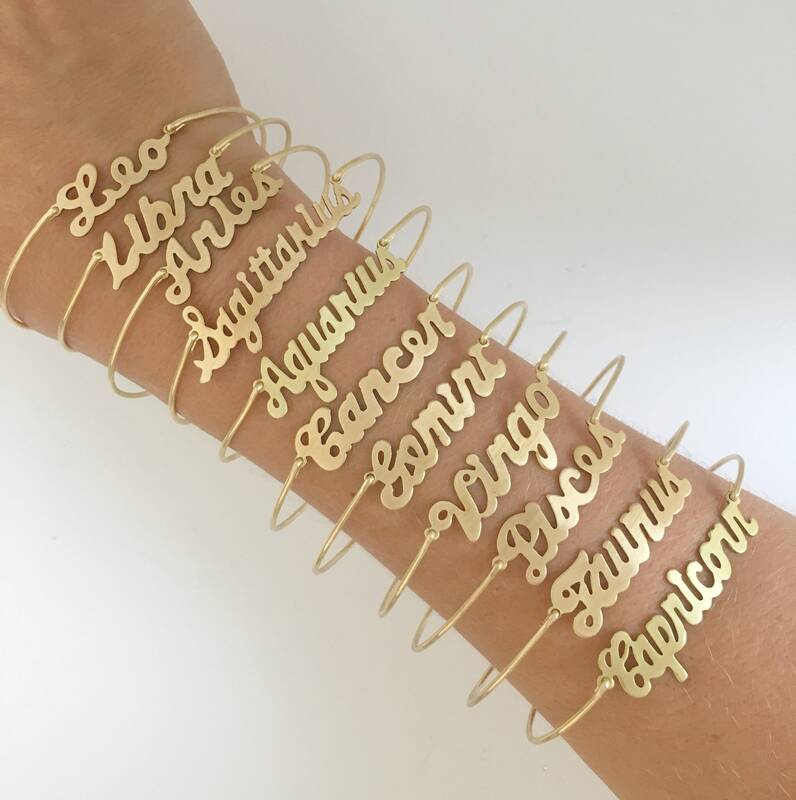 Zodiac Bracelet - A gold tone brass writing of your choice of zodiac sign has been transformed into a dainty & delicate zodiac sign bracelet with a gold tone brass band. I can also make your zodiac jewelry with a 14k gold filled band for an additional $10. 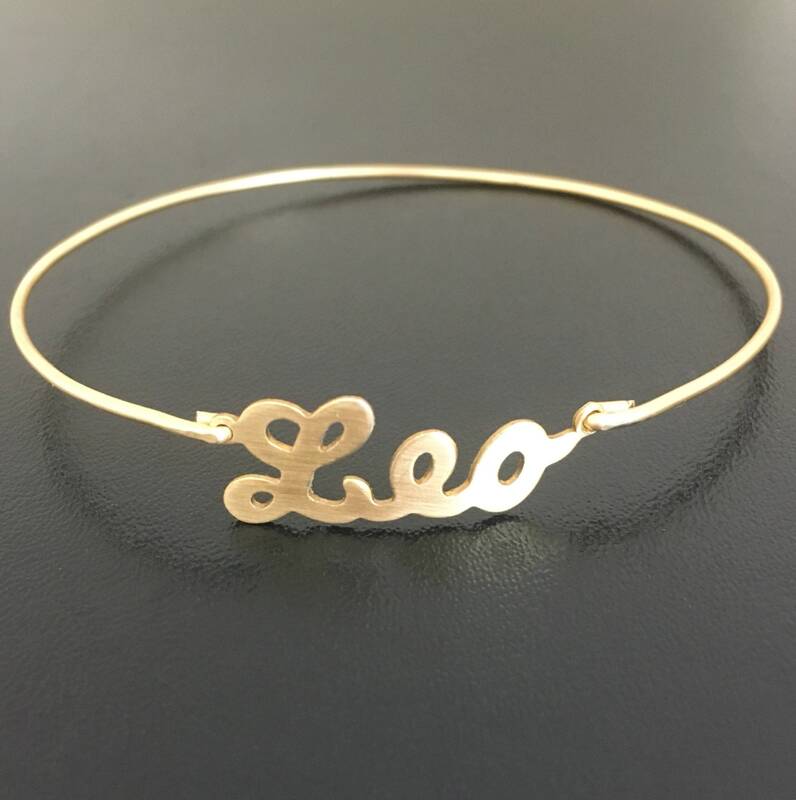 If you would like this option for your zodiac bangle bracelet, select from options when ordering. 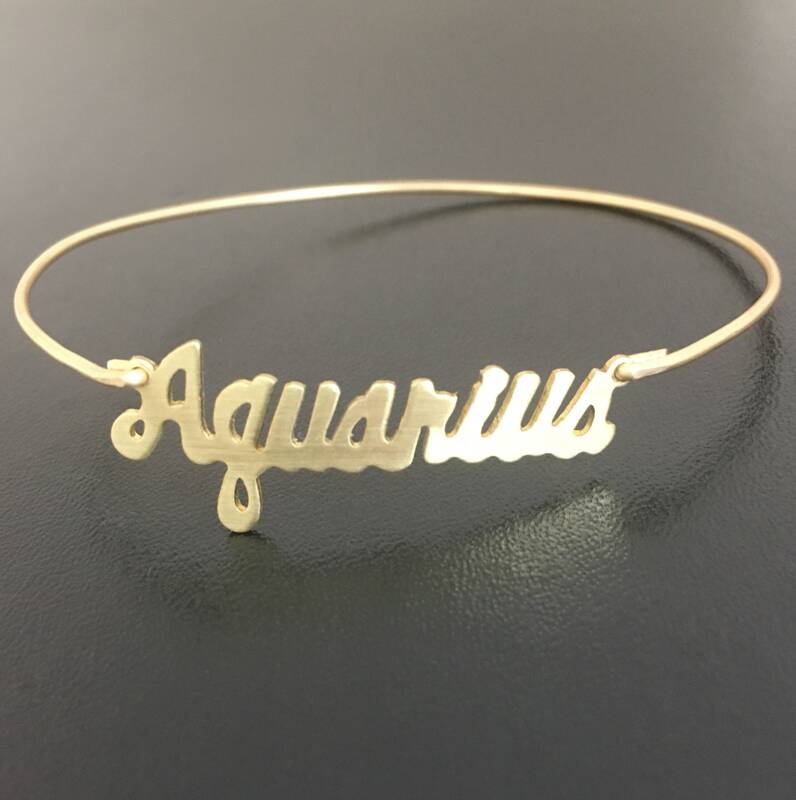 These also make great gifts whether you need Aries jewelry, Taurus jewelry, Gemini jewelry, Cancer jewelry, Leo jewelry, Virgo jewelry, Libra jewelry, Scorpio jewelry, Sagittarius jewelry, Capricorn jewelry, Aquarius jewelry, or Pisces jewelry. 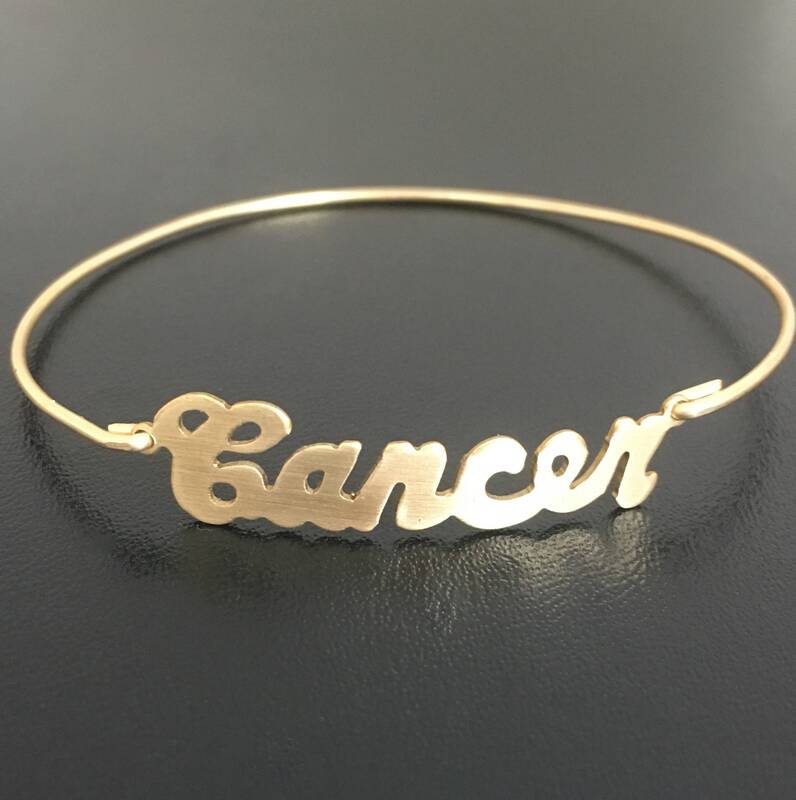 Please specify size in notes to seller during checkout for your astrology bracelet... Choose from one of my regular sizes below by measuring one of your favorite bangles. 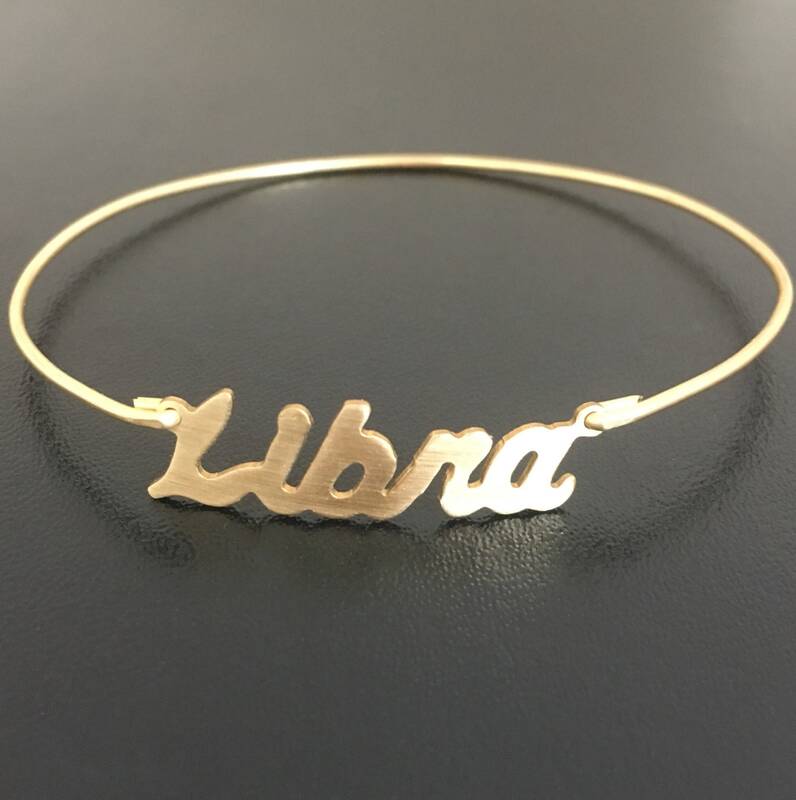 Or give me the circumference of the widest part of your hand where the astrology bangle bracelet has to be pulled over; then I can size it for you. All of my bangles are closed and can’t be opened. 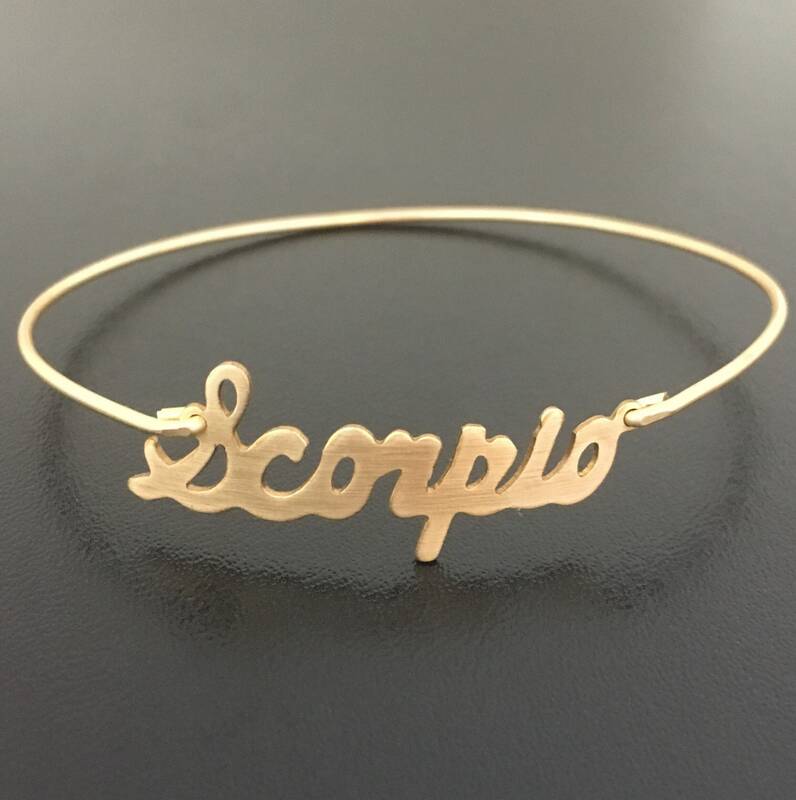 Therefore, this astrology jewelry has to fit over the hand. 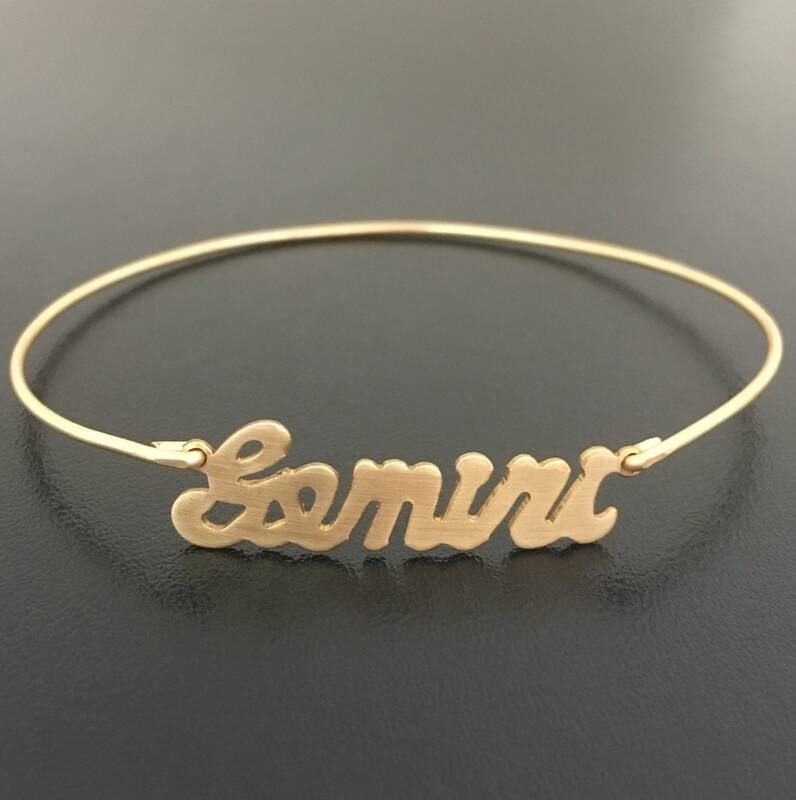 Custom: choose a custom size for your astrological bracelet. 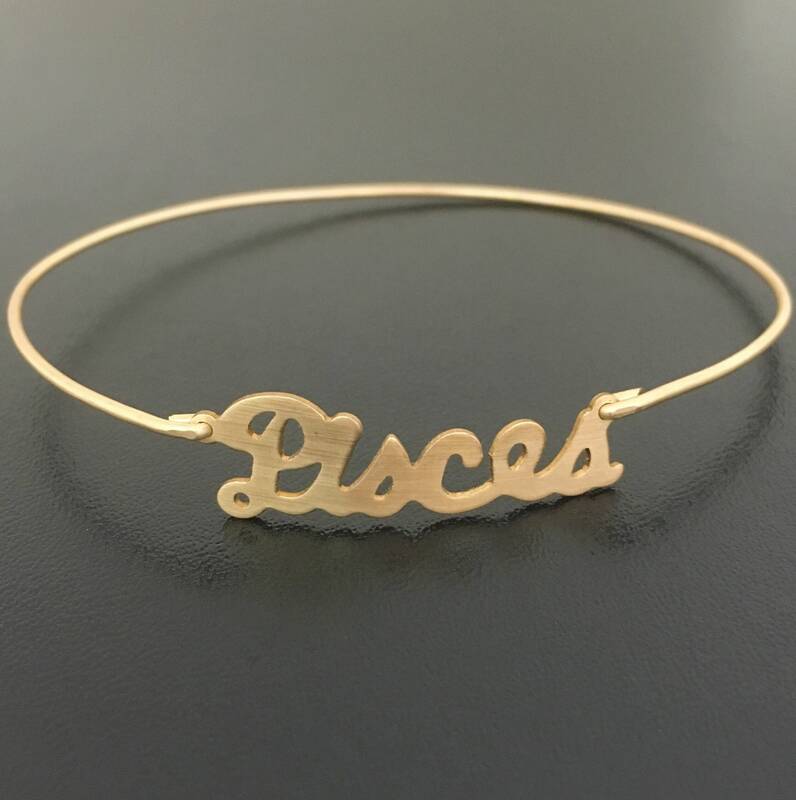 This zodiac bracelet created and hand crafted with great care and love for you and yours. All of my items including this astrological jewelry are special handmade creations that are original Frosted Willow designs. 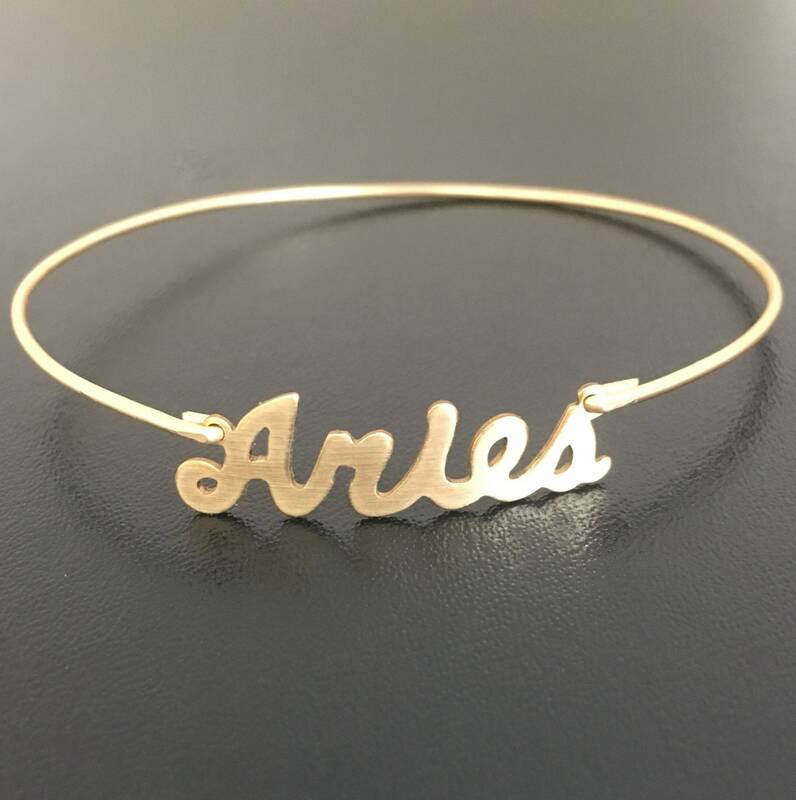 I hope you enjoy your choice of; Aries bangle bracelet, Taurus bangle bracelet, Gemini bangle bracelet, Cancer bangle bracelet, Leo bangle bracelet, Virgo bangle bracelet, Libra bangle bracelet, Scorpio bangle bracelet, Sagittarius bangle bracelet, Capricorn bangle bracelet, Aquarius bangle bracelet, or Pisces bangle bracelet.